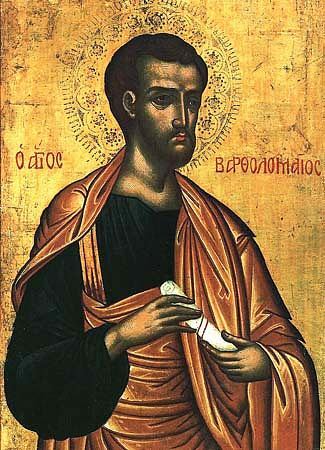 The Transfer of the Relics of the Apostle Bartholomew Was at the end of the VI Century. His apostolic activity and martyr's end are remembered by the Church on 11 June. The Apostle Bartholomew suffered for Christ in Armenian Albano (now Baku) in the year 71, where also his holy relics were situated. From the relics of the holy apostles occurred numerous miracles, and many of the unbelieving were converted to Christ. Under the emperor Anastasios (491-518) the relics of the Apostle Bartholomew were transferred into the newly constructed city of Anastasiopolis (or Dareia) and remained there until the end of the VI Century. When the city of Anastasiopolis was captured by the Persian emperor Khozroes, Christians took up the chest with the relics of the Apostle Bartholomew and fled with it to the shores of the Black Sea. Having overtaken them, pagan-priests threw the chest with the relics of the Apostle Bartholomew into the sea. Together with it, 4 other chests were thrown into the sea containing the relics of the holy Martyrs Papian, Lucian, Gregory and Akakios. By the power of God the chests did not sink into the depths of the sea, but rather accomplished a miraculous floating upon the waves and reached Italy. The chest with the relics of the Apostle Bartholomew came to land at the island of Lipari, and the remaining chests continued their journey and came to land at various places in Italy. The chest with the relics of the Martyr Papian halted at Sicily, the Martyr Lucian – at Messina, the Martyr Gregory – at Calabria, and the Martyr Akakios – at Asculusa. The arrival of the relics of the holy Apostle Bartholomew was revealed to the bishop of the island of Lipari ‑- Agathon, who went with clergy to the shores of the sea, took up the chest from the waters and solemnly transferred it to church. From the relics of the Apostle Bartholomew there flowed out myrh, giving healing for various illness. The holy relics remained in the church of the island of Lipari until the middle of the IX Century, when the island was captured by pagans. Christian merchants took up the holy relics of the Apostle Bartholomew and transferred them to the city of Beneventum, where they were received with great veneration and placed in the main church of the city.